For years, one of the main pieces of feedback we’ve heard from you - our clients, friends and meeting planning colleagues - is that Columbus needs a single, 1,000-room hotel connected to the Greater Columbus Convention Center (GCCC). We’ve heard you, we’ve sympathized with you, we’ve worked hard to find a solution and we are pleased that we finally have one to offer. 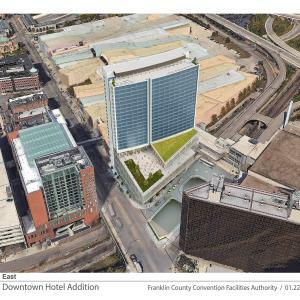 Last week, a 470-room expansion was announced for the Hilton Columbus Downtown, a headquarter hotel of the GCCC, which will bring the total number of convention rooms on the property to 1,002. An 18,000-sq.-ft. ballroom and 42,000 sq. ft. of meeting space are also included in the plans. The concept still requires approval by the city and the county, but Columbus is committed to investing in it’s future as a top city for meetings, conventions and trade shows. We understand that a single convention hotel property with at least 1,000 rooms connected to the GCCC is crucial for larger national and international meetings and conventions to bring their events here. Coupled with the recent $140 million renovation and expansion of the GCCC, we are excited for what the future holds with the announcement of this enhancement. The current design calls for a new 22-story tower to be built adjacent to the GCCC, across from the existing Hilton Columbus Downtown. We are still about six months out from being able to provide official renderings of the property, as a developer will have to be chosen once final approval goes through, but the renderings included with this post are meant to give an idea of where the new tower will be placed. Nicknamed Hilton 2.0, the new convention hotel rooms will connect to the GCCC at the same spot as the skybridge from the current Hilton property, and offer a seamless experience for groups wishing to house attendees under the same hotel banner. This project is a result of efforts from the Franklin County Convention Facilities Authority (current owners of the Hilton), Experience Columbus, the City of Columbus, Franklin County and other community leaders following feedback from meeting professionals, national brand sales representatives and industry experts. Last week, representatives from those groups joined together and expressed their commitment to building the new convention hotel rooms during a community briefing. 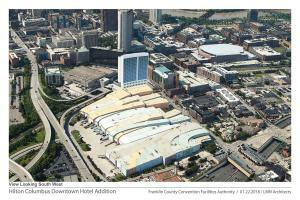 Existing plans call for a groundbreaking this fall, with the new convention hotel expansion opening late 2021. No additional details on the project are known at this time, though the resolution is expected to go in front of Columbus City Council in the coming weeks and we look forward to sharing the latest information as it becomes available after that time.